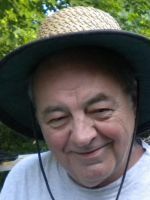 Richard Daybell has been a writer/editor for most of his adult life, working at various times for a public library, a multinational corporation, a university, and state government. With his wife Linda, he also spent seven years as owner/chef of a nine-room country inn in central Vermont. His short stories and short humor have appeared in regional, national and international commercial publications including American Way and Hemispheres, the inflight magazines for American Airlines and United Airlines, The New York Times, Buffalo Spree, Salt Lake City Magazine, and Tampa Tribune Fiction Quarterly as well as such literary magazines as Rosebud and Dandelion. Several of these stories appear in the collection Calypso: Stories of the Caribbean. He is also the author of two novels. Richard and Linda are now living in Vermont, in the Green Mountains, where Richard continues to write. I have this insidious little voice inside me. When I read a book, it says to me “Well, why didn’t you write that book?” If I watch a movie, it says “When are they going to make a movie out of something you’ve written?” If I see an interesting person walking down the street, it says “Why wasn’t that guy with an elephant trunk for a nose in your last book?” If I try to take a nap, the voice says “Get up and write or you’ll die.” I don’t pay any attention to the little voice. Drinking inspires me to write. Outlines are amazing. With a good outline, you can move through the creative process like a painted ship on a painted ocean, smoothest of sailing all the way. I wish I could figure out how to do an outline. Whenever I try, it comes back to bite me, or I’ve wandered hopelessly off course by the third page. I guess that makes me a seat of the pants writer, although I try not to wear pants when writing. I do, but most of them refuse to talk to me. If they do talk to me, they usually insult me. An author has to learn to take such abuse. However, when one character called me a two-bit scribbler, I killed him off on page 2. You’ve got to let them know who’s boss. Read authors you admire. Read authors you hate. Read. And write. Drink occasionally, but never heavily — unless it’s after noon. I suggest exploring the traditional publishing route first. It will clear your head of any notion that this is an easy business or a logical one. The best approach is to find a publishing house that’s owned by a cousin or a brother-in-law. The next best approach is to self-publish. I try not to think about the future of publishing. (I try not to think about the future of anything, actually.) I worry that someday they’ll stop printing books, that books will be electronically downloaded to the back of our eyelids. I guess I worry too much. I try to write instead.